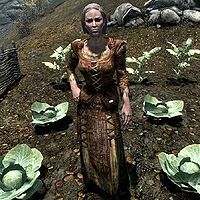 A green, dense vegetable, commonly grown throughout Skyrim. Its leaves are an important foodstuff. 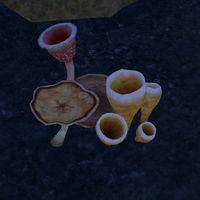 A white-colored mushroom commonly found growing in caves around Cyrodiil. It is said to mark the place where someone died. 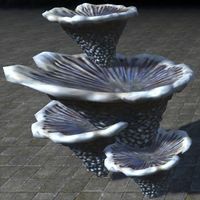 Caldera Mushrooms are a rare specimen of fungus found growing within Nilthog's Hollow in Vvardenfell. Canis Cup Mushrooms are a type of fungus with an overpowering earthy odor. 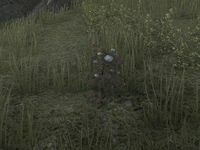 They are found on fallen logs around Jorunn's Stand in Eastmarch, and are known to keep wolves from attacking when eaten. A brown root commonly found growing near rocky outcroppings, often beneath the snow line in tundras and marshes. 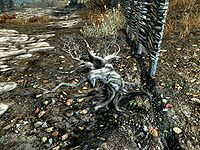 In Skyrim, it is an old tradition to rub canis root on the trees surrounding your house as a ward against werebears. 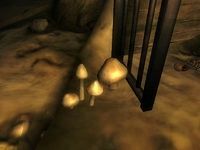 A mushroom that is only found within Capstone Cave in Cyrodiil. It is known for its ability to stop bleeding. 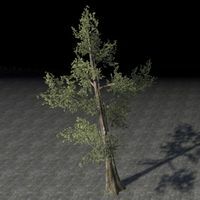 A low-growing tree with pink leaves, found growing in secluded ancestor glades around Tamriel. Canticle trees attract ancestor moths, and the bark is used by members of the Ancestor Moth Cult to attract moth swarms. 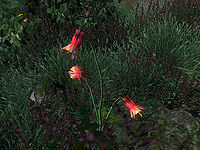 Cardinal Flowers are bright red flowers that can be found growing in the temperate regions of Tamriel. They are also popular in home gardens. 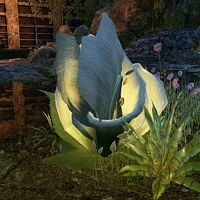 A small, leafy plant found growing on farmland throughout Cyrodiil and Skyrim. 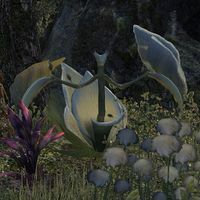 Catapult Cabbages are a variety of flora which grow in Murkmire. The main part of the plant is its' over-sized white flower, which olds the means of its protection. When it feels threatened it will lash out with great force at the threat. The source of the ability comes from the animal-like structure hidden by the petals, which resembles a praying mantis with serrated limbs. The Catapult Cabbage is capable of knocking a full-grown Argonian off their feet. These blue fungi live on walls. They thrive in caves and in the Spiral Skein. They have also been sighted in places like Fang Lair. 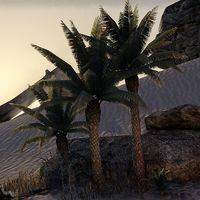 A type of palm tree found in the Alik'r Desert. The pungent fruit is sometimes used by the Ash'abah in rituals. 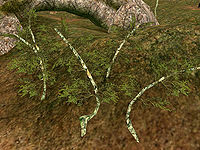 Cherry Blossom Trees are native to both Summerset and in Stonefalls, Morrowind. Cherry Blossom trees in Summerset can come in both Pink and White varieties. In Stonefalls, Cherry Blossoms can come in Orange and Purple varieties and have Thorns in their trunk. A long, crimson-colored spiny vine. Cultivated by assassins for its poisonous berries. Chokeweed is a tough shrub growing in the rocky highlands of the West Gash. 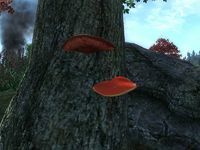 Both red and yellow varieties are shelf mushrooms that grow on the sides of trees throughout the West Weald region of Cyrodiil. 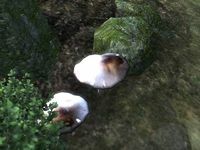 Clouded Funnel are small, white capped mushrooms found in high altitudes and the Blackwood area of Cyrodiil. Columbine flowers have a distinctive uniquely shaped red head. They are common in the West Weald region of Cyrodiil. 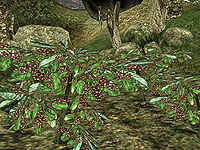 Comberry is a shrub found growning in the Ascadian Isles, that produces a bitter tasting berry. Corkbulb is grown for its tough, fibrous roots. 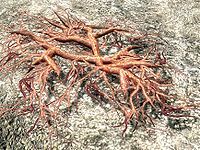 In Vvardenfell the root is often used as a substitute for wood as trees struggle to grow in its harsh environments. Corkbulb grows primarily in the Ascadian Isles of Vvardenfell. 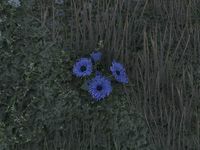 A small plant with blue petals found growing all across Tamriel. A Corn Stalk on a farm. 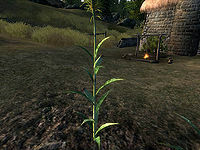 A tall, thin plant with visible corn bulbs found growing in the fields of farms around Cyrodiil. A small plant with puffy white flowers whose fibers can be spun into thread and used to make homespun clothing. A tendril-like vine that fans out across the ground. 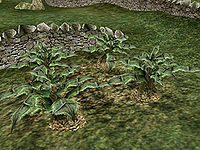 It is found in volcanic areas of Tamriel. 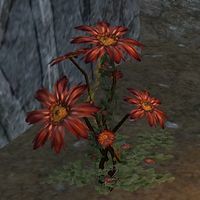 A slightly poisonous flower with a spicy aroma that can only be found in Ayleid ruins in Rivenspire. 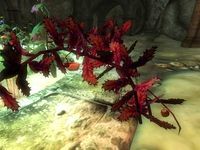 A special variant of Nirnroot that can be found exclusively in Blackreach. 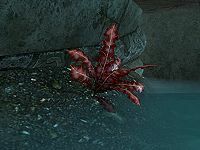 Similar to regular Nirnroot, the crimson variety makes an audible humming sound. Its magical potential in alchemy is far greater than the common Nirnroot. 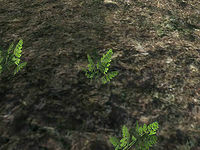 Cypress trees are found growing near marshy areas all around Tamriel. They can also be purchased from housing furnishers to be planted on homeowners' properties. They are a popular topiary tree, but are also seen growing naturally. This page was last modified on 3 March 2019, at 23:31.